This modern apartment sleeps 4 people comfortably with a bedroom and newly fitted bathroom at mezzanine level. Downstairs comprises of a fully equipped kitchen (catered for 6), breakfast bar, dining room table, sleeping area and a separate toilet. Secure underground parking is available and the balcony is suitable for storing ski equipment. The apartment is on the 3rd floor of a modern block with a lift and security entry system in the Chamonix Sud development. Located within 5 minutes walk from the main hub of restaurants and bars and a 2 min to the ski bus stop. There's plenty to do in the summer too - mountain biking, canyoning, water rafting, or a take a trip in Europe's' highest cable car up Mont Blanc or the train up to the Montrevers Glacier for amazing panoramic views of the valley below. Or, if that's not your thing you could laze by the swimming pool or sit on the terrace of one of Chamonix's many cafes and enjoy the views and local delicacies. I grew up in Geneva and have always loved Chamonix, so bought the apartment so I could enjoy holidays there both in the summer and the winter now that I was living in the UK. I have such happy memories of holidays in the apartment which is so centrally located it used to be great for the nightlife, and now that we go back with our 2 little girls it's great to be so near the shops, and restaurants. Private Underground Parking is available and included in the rental fee as well as an English speaking management service who are available free of charge to help with booking airport transfers/ski & snowboard hire/ski/snowboard lessons/excursions etc. Great apartment. Just off the beaten path in Chamonix with a short walk to restaurants and bars. Bus station just around the corner too for good access to all the areas with bus service. The apartment is nice and clean with everything you need to have a great stay. Only critism is that it could do with a freshen up decoration wise. We enjoyed our week long walking holiday in Chamonix staying in the flat. The flat was a great base, a short walk to the centre for restaurants, cafes, ice cream and bars, but also had enough equipment when we preferred to make meals ourselves. There is a nice bakery nearby, which we got our breakfast from and ate on our small balcony. The basement parking was convenient, though required careful driving to get past the concrete pillars without scratching the hire car. 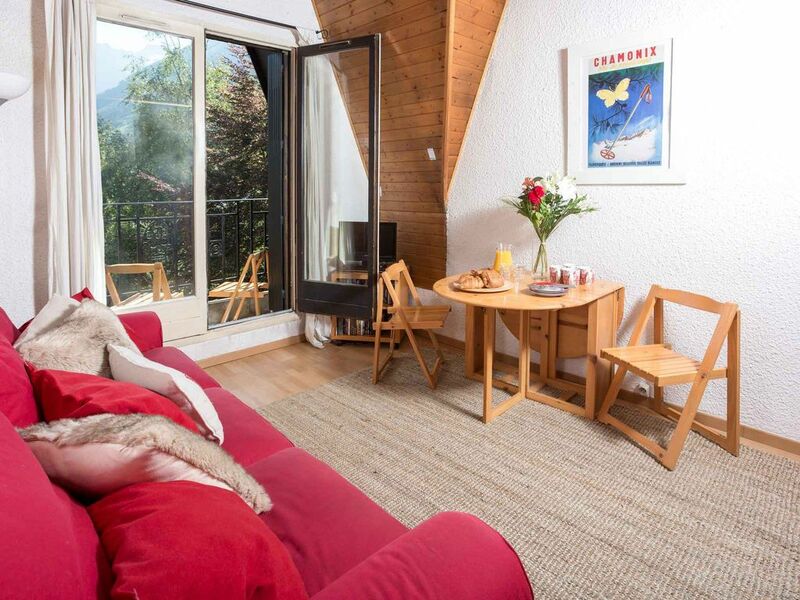 The apartment is in a very convenient location, right by the Aiguille du Midi, and well-designed for efficient living. It's stocked with the basics for cooking meals, and the books and DVD collection were a nice addition. Kirstie, the owner, was very responsive and great to work with. We did experience issues with the wifi (which is a shared connection managed by the building), but otherwise had a good stay. We were in Chamonix for the UTMB and needed a place to stay. The apartment is as described. It was simple but comfortable. It's conveniently located: close to restaurants, supermarket, shops. The Aiguille du Midi cable car is just downstairs. The bus terminus is at 2 minutes walk (bus coming from Geneva will drop you there). WIFI is available in the apartment. We didn't meet Kirstie but corresponded by emails and Kirstie was very friendly and fast to respond to our questions. We have definitely recommended to our friends and will certainly contact Kirstie again next time we travel to Chamonix. Location of the apartment is perfect, extremely close to bars and restaurants and less than a 5 min walk into chamonix centre. A 2 minute walk to the bus stop and ski rental and spar within 30 seconds. Sofa bed was comfortable and apartment suited every requirement for our long weekend. Would stay here again. The apartment is exactly what you want for a weekend break. Location is spot on, easy walking distance to bars and Restaurants. Amenities in the apartment are well thought out, the obligatory WIFI, but the TV and DVD player (plus decent DVD's) is a nice touch. The sofa bed is a good size if you are sharing and the bed on re mezzanine is super comfy! The apartment was nice and clean and someone had even thought to leave a tea bag or two. Have nothing bad to say about this property, absolutely would recommend to friends (already have). We had a ball and can't wait to go back! Chamonix - recently voted the world's top resort by The Times - has a vast and varied ski area. Chamonix is only an hours drive from Geneva airport (88 kms) and 220km from Lyon International Airport. There are many companies offering very competitive rates on airport to resort transfers. The ski area is divided into 5 different areas of varying difficulty making it ideal for group or family holidays as there will be something to suit everyone. Ski: Chamonix is widely regarded as one of the most superior ski areas in the world. The 5 separate ski areas cater for all abilities from the complete beginner (ESF and Panda Ski Club - for kiddies - available) to the most extreme skiers. The off-piste skiing is internationally renowned and guides are available to explore more of the mountain and to take you down the Vallee Blanche - glacier skiing at its best! Flexible with arrival / departure dates (i.e. not only Sat - Sat bookings). Get a 10% discount for any 2 week rental!